Free bottle of CHILLI & CUMIN DRESSING for in-store tastings! Have your customers tried our NEW Farrington’s Mellow Yellow Chilli & Cumin Dressing yet? We have the perfect opportunity for you to offer them an in-store tasting of this delicious new product. Order a case & receive a FREE bottle! Order min. 1 case of Farrington’s Mellow Yellow Chilli & Cumin Dressing from either Cotswold Fayre, Hider Foods or direct from us during May and we will follow-up your order with a free 250ml bottle of our new Chilli & Cumin Dressing. Use this bottle to hold an in-store tasting and allow your customers to taste our brilliant dressing. Once they tasted it, they’ll simply have to buy a bottle to take home. Our Chilli and Cumin Dressing adds a fantastically vibrant flavour to anything from a simple salad to marinated salmon. We have balanced the warm heat of chilli flakes with the gentle aroma of cumin seeds to create a deliciously daring dressing. The flavours found in our Chilli and Cumin Dressing pair perfectly when drizzled over fresh salads, roasted vegetables, fish or meat. Aromatic, spiced and versatile enough to have a starring role as a dressing, marinade and sauce, let our Chilli & Cumin Dressing add gusto to your cooking. Holding an in-store tasting couldn’t be easier. Set up a small table in a busy area of your shop, near the entrance works quite well. Pour a few tablespoons of dressing into a small dish and cut up a few slices of a white farmhouse loaf into small, 1cm cubes and place into a bowl. Set these up on your table with a price sign and a few recipe leaflets, which we are happy to provide you, details on how to get these are below. All you need now is a member of staff to stand by the table and encourage your customers to have a taste and direct them to where to pick up their bottle! To request free recipe leaflets, contact us here. How do I take advantage of this offer? Order a case of Farrington’s Mellow Yellow Chilli & Cumin Dressing through your Cotswold Fayre or Hider representative or email us here. Once you have placed your order, your wholesaler will let us know and we will send your free bottle of Chilli & Cumin Dressing separately. Place your order with Cotswold Fayre here. Place your order with Hider Foods here. Mellow Yellow Chilli & Cumin Hummus – Using butterbeans in our Chilli and Cumin Hummus adds a deliciously mellow and gentle flavour. By using Chilli & Cumin Dressing, this recipe has the least possible number of ingredients to make it extra simple and yet is still packed full of flavour with a gentle heat from the chilli in the dressing. Using butter beans in hummus was something new for us, but we’re now converted! They add a smoother texture and a lighter flavour which is perfect for dips such as this so the chilli and cumin flavours can shine. Puy Lentil Lunch Pot with Feta, Pomegranate and Pumpkin – This Puy Lentil Lunch Pot is quick to make and great as a healthy filling lunch, this little pot is bursting with delicious goodness to get you through the afternoon, pop it on your desk and dig in. With puy lentils, feta cheese, rocket, mint, red onion, cucumber, pomegranate and pumpkin seeds, this salad is bursting full of colour and flavour to give you a lunchtime boost. A drizzle of Chilli & Cumin Dressing adds a delicious aromatic flavour to this simple salad. 1. The promoter is: Farrington Oils Ltd (company no 05372301) whose registered office is at Bottom Farm, Brook Street, Hargrave, Northamptonshire, NN9 6BP. 2. The giveaway is open to trade customers buying full cases of Farrington’s Mellow Yellow Chilli & Cumin Dressing in a wholesale format , eg a full cases of 6 bottles, from Hider Foods, Cotswold Fayre or Farrington Oils. 3. You must purchase at least 1 case of Farrington’s Mellow Yellow Chilli & Cumin Dressing during the promotional period to be eligible for this giveaway. 4. The promotional period is 01/05/19 – 31/05/19. The order of Farrington’s Mellow Yellow Chilli & Cumin Dressing must be placed within these dates. 5. 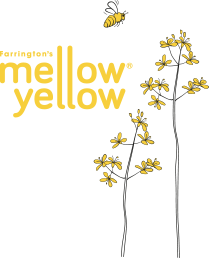 Only 1 free bottle of Farrington’s Mellow Yellow Chilli & Cumin Dressing will be sent to each customer, regardless of how many orders are placed during the promotional period or how many cases are ordered. 6. Closing date for entry will be 31/05/19. All orders must be received by this date to be eligible for the promotional bottle. 7. No responsibility can be accepted for orders not received for whatever reason. 8. The rules of the giveaway and how to claim your free bottle are as follows: We are offering a free bottle of Farrington’s Mellow Yellow Chilli & Cumin Dressing for trade customers when they purchase a case of Farrington’s Mellow Yellow Chilli & Cumin Dressing from Hider Foods, Cotswold Fayre or Farrington Oils during May 2019. We will send one free bottle to each trade customer that purchases a case during May, we will only send 1 bottle to each customer regardless of numbers of orders placed and number of cases purchased. The free bottle will be dispatched separately to your order and will come direct from Farrington Oils. 9. The promoter reserves the right to cancel or amend the giveaway and these terms and conditions without notice in the event of a catastrophe, war, civil or military disturbance, act of God or any actual or anticipated breach of any applicable law or regulation or any other event outside of the promoter’s control. Any changes to the giveaway or terms and conditions will be highlighted as soon as possible by the promoter. 11. The giveaway is as stated and no cash or other alternatives will be offered, it is not transferable and is subject to availability. We reserve the right to substitute any giveaway with another of equivalent value without giving notice. 12. Entry into the giveaway will be deemed as acceptance of these terms and conditions. To join our mailing list, please tick this box. You can unsubscribe at any time. Already subscribed? You can change your mind and unsubscribe here.